How do you turn a short circuit into an open circuit, or a capacitor into an inductor? 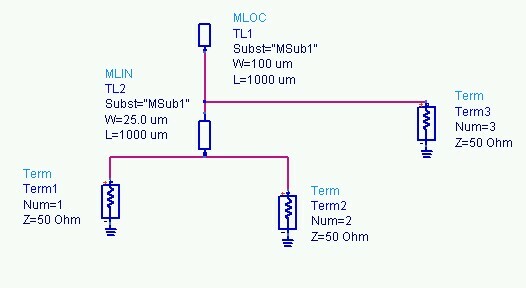 Here we will describe some of the magic that happens when you use the distributed properties of transmission lines, in particular when you use lines of length one-quarter wavelength, or multiples of a quarter-wavelength. What's so special about a quarter-wavelength? 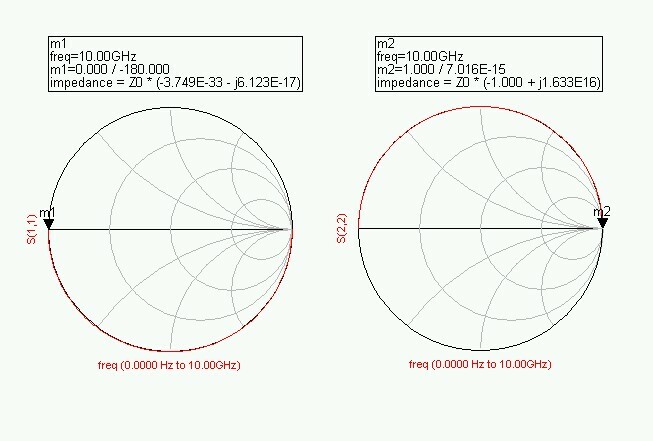 Referring to a Smith chart, if you are already at a matched impedance condition, any length of transmission line at the system characteristic impedance Z0 does nothing to your input match. 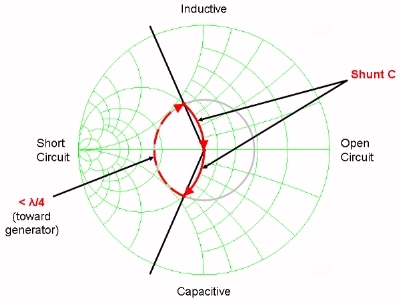 But if the reflection coefficient of your network (S11 for example) is at some non-ideal impedance, adding transmission line between the network and the reference plane rotates the observed reflection coefficient clockwise about the center of the Smith chart. Further, the rotation occurs at a fixed radius (and VSWR or return loss magnitude) if the transmission line has the same characteristic impedance as the source impedance Z0. By the time you have added a quarter-wavelength, you have gone 180 degrees about the center of the Smith chart. Suppose your network was a short circuit, the left "corner" of the Smith Chart. Adding one quarter-wavelength moves you 180 degrees to the right side of the chart, to an open circuit. It's Opposite Day, Sponge Bob! That's the magic of a quarter-wavelength But there's much more that you can do, as you will see on this page. Here's a frequently asked question: if a quarter-wave is 90 degrees in phase length, why does it transform you 180 degrees on a Smith chart? Consider that here we are plotting reflection coefficients on the Smith chart. Thus an imaginary signal that you send through a transmission line of one quarter wavelength must travel fully half a wavelength, since it travels down the quarter-wave line, gets reflected, then returns down the quarter-wave line. So when you are plotting reflection coefficients, moving in a complete "circle" means only adding 180 degrees! Note that if you are plotting transmission coefficients (such as S21 of a two-port), "90 degrees is 90 degrees". Starting with an open circuit, one quarter wavelength away you will "see" a short circuit. Starting from a short circuit, one quarter wave away you have an open circuit. 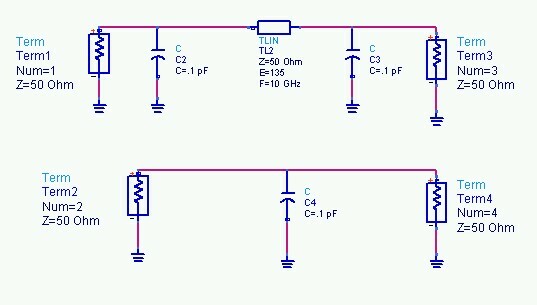 Thus you can create an "RF open circuit" that is a DC short circuit, and vice versa. These two properties are used to create DC and/or RF grounds for circuits, bias tees, and much more. 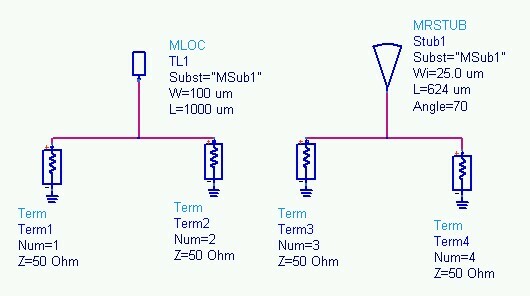 Below are ADS models of a open circuit and a short circuit stub. The electrical length of each stub is 90 degrees. 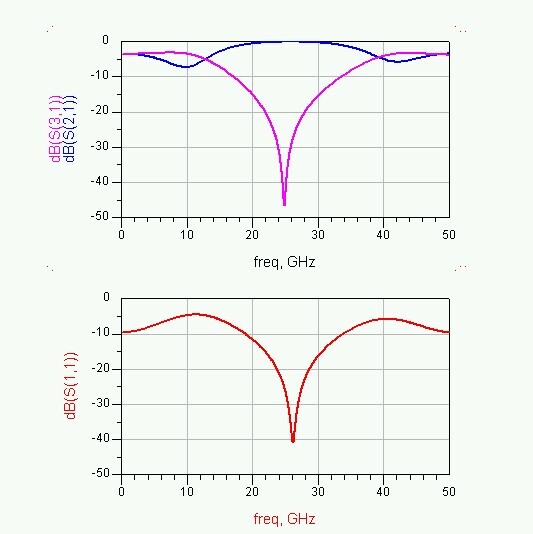 The following figure shows the reflection coefficient of the above stubs, versus frequency, starting at DC and sweeping up to the quarter-wave frequency (10 GHz, denoted by markers M1 and M2.) The open circuit S11, plotted on the left) sweeps from an open to a short, while the short circuit (S22, on the right) sweeps from a short to an open. ADS wouldn't lie, would it? Note that both responses sweep clockwise with frequency, and would keep going around and around the Smith chart if you kept increasing frequency. The tradeoff you are making is circuit size , because low-impedance microstrip lines are wider than high-impedance lines. Below are ADS models of two microstrip stubs on a 50 micron (2 mil) GaAs substrate (Er=12.9). We'll replace the model with a layout one of these days, it will help illustrate the point better. 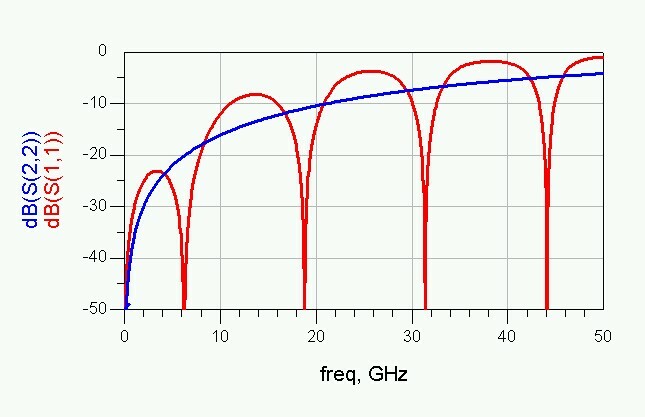 What we are looking for with an open-circuit stub is a high return loss, like -1 dB. The plot below shows that the radial stub has better bandwidth. Why is a radial; stub better? We think it's because it has a larger fringing capacitance at the open end, which adds a "lumped-element" quality to it. Who cares, it just is! Note that whatever EDA software you are using, you will need to take into account the fringing capacitance at the end of the open stub. The ADS radial stub model attempts to do this, but it would be better if you modeled the stub using Momentum or another 2.5D E-M solver. Rule of thumb: if you are trying to effect an RF short circuit using a quarter-wave stub, use a low impedance line, or better still, use a radial stub. Later we'll show you that if you are trying to transform your RF short stub to an open circuit (as you would in a bias tee), you should use a high impedance line. There are other considerations, such as current carrying capacity, that you'll need to consider. A simple bias can be arranged from quarter-wave lines as shown in the figure below (again we are using 50-micron think GaAs as the substrate in our example). A bias tee is a "diplexer", a type of filter that provides two paths from a common node, the dominant path is dependent of the frequency of the signal. Look this up in our section on filters. In the simplest bias tee, an open circuit stub (low impedance, here W=100 microns) is used to create an RF choke in the DC arm, to allow DC bias to inject but isolate RF from the bias network. A high-impedance line (here W=25 microns) is used to transform the RF short circuit to an RF open circuit; this is necessary so that the bias arm does not load the RF path. 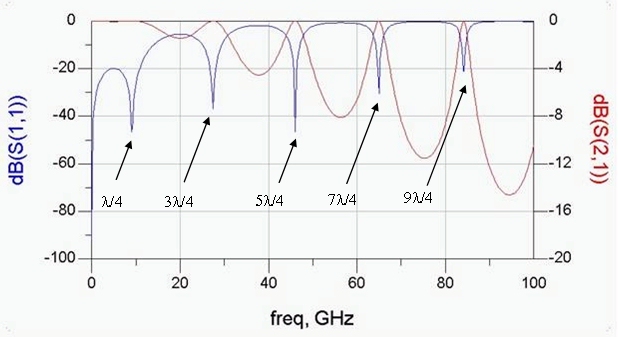 The lengths of the quarter-wave sections were chosen so that the bias tee works best at about 25 GHz (1000 microns is about a quarter-wave at that frequency). The most important S-parameters of the simple bias tee are shown below. S21 represents the transmission coefficient along the RF path, it is ideally 0 dB at the RF frequency, but we would forgive the bias tee if it had a few tenths of a dB of RF loss. S31 represents the isolation of the DC connection to the RF path, it is ideally a small magnitude (perhaps 30 dB). The reflection coefficient S11 is also plotted separately, this gives an idea of how much the bias arm is loading the RF path. A good value for S11 is better than 14 dB (VSWR of better than 1.5:1). Studying the graphs, it is apparent that this simple circuit performs well over 20% bandwidth. This topic has moved to a separate page. Constructive and destructive interference occur in many physical sciences involving wave phenomenon, including microwaves. Is it time for another sad Microwaves101 story in which Wally enlightens his coworkers on this subject? You betcha! Bert: Better go get Evita, it's time to scrape off another one of these mixer chips. I guess the whole waffle-pak stinks. Ernesto: Hey, here comes Wally, let's ask him what's going on. Wally: The boss-man woke me up from my nap and said to come out and fix your latest mess. Did you measure the test fixture back-to-back like I told you? Ernesto: Sure, we did that, the return loss at 28 GHz was better than 20 dB. Like everything I design on HFSS, the connector transition is just about perfect! Wally: That don't mean squat. 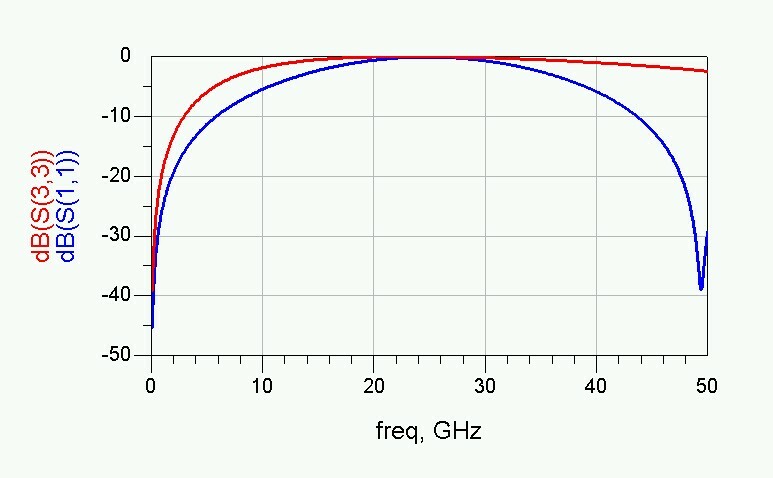 What's the worst case return loss you have between 0 and 40 GHz? Bert: We didn't have time for all those frequencies, so we just measured it at a single point. Who cares about performance outside of the band, O Great One? Bert: Wally, we see about 4 dB return loss at 20 GHz. So what? Wally: I'll tell you what, you longhaired freak, that means each connector probably has no better than 9 dB return loss in your band, which explains why Evita has been so crabby lately since you've had her scraping off perfectly good MMICs all week for no reason. If it wasn't lunch time I'd go have a talk with the Big Man and get me a piece of your next raise! Bert: I don't understand how he did that calculation in his head, but we'd better go have a look at that connector transition you designed on HFSS. Ernesto: Sure, but I'm late for the "Midget Transvestite Hispanic Engineer of the Year" Award luncheon. Bert: Good luck! Diversity is a beautiful thing. Don't worry if you don't win, everyone at the meeting gets a nice wooden plaque that says "Participant Award!" Evita: Von't von of you dahlinks pleeeeze rub my neck? Ernesto: Yikes! That's harassment, I'm telling HR! 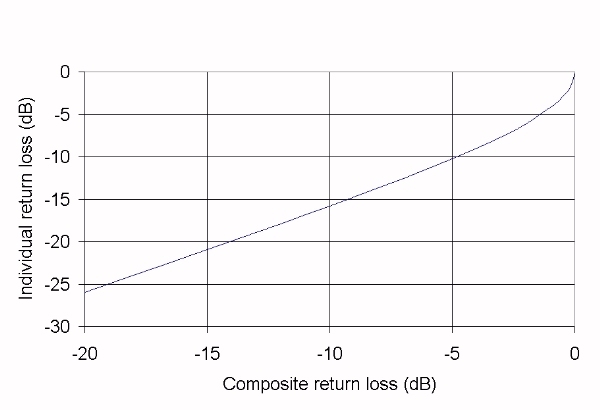 Rule of thumb: due to constructive interference, the individual return loss of identical mismatches are usually about 6 dB better than the worst case observed return loss of two mismatches measured together. Let's beat this topic to death, showing how you can use it to your advantage. Suppose you are building a limiter or switch that requires a PIN diode in shunt across a transmission line. In the "low-loss" state it behaves like a capacitor. It's impedance, equal to jwC, puts you slightly northwest of fifty ohms on the Smith chart. As you go higher in frequency, your VSWR degrades more and more, until it is unusable . A very simple solution is to use two identical diodes, separated by slightly more than a quarter-wavelength, to cancel out each other's mismatch. Below is an example, using PIN diodes with off-capacitance equal to 0.1 pF. 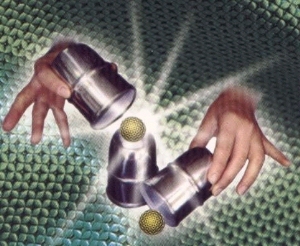 Rule of thumb: two identical mismatches can be made to cancel each other by locating them approximately one-quarter (or perhaps three-quarters) wavelength apart. 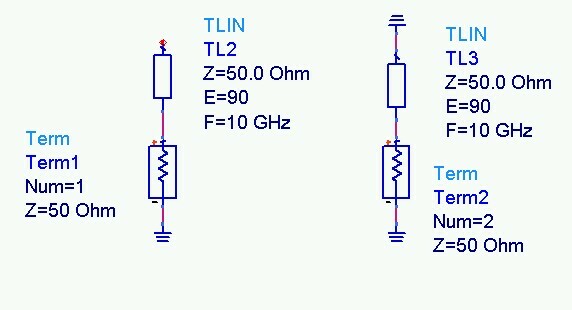 This rule is often used in PIN diode switch and limiter design. Note that shunt capacitive VSWRs require slightly less than one-quarter-wavelength to cancel (thanks, Mike! ), while shunt inductive mismatches require slightly more. The next two figures help drive home this point. 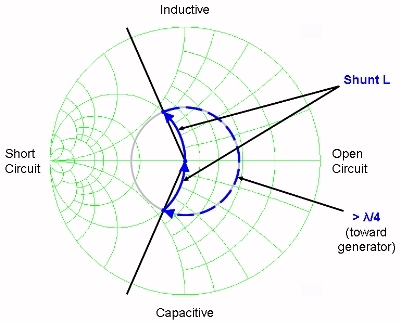 Shunt capacitive cancellation is illustrated below; remember that a quarter wavelength line would move you 180 degrees on the Smith chart. Click here to go to our page on coupled line couplers.